Not all of the enemies in Mansions of Madness are monsters or direct combat combatants. The Witches are more of a horror causing distraction (as hinted at by their, um, clothing choices). I’ve put together a guide to painting witches. As these have lots of exposed flesh, I focussed on painting the flesh tones. One witch was painted in a dark brown skin and a second in a pale skin. 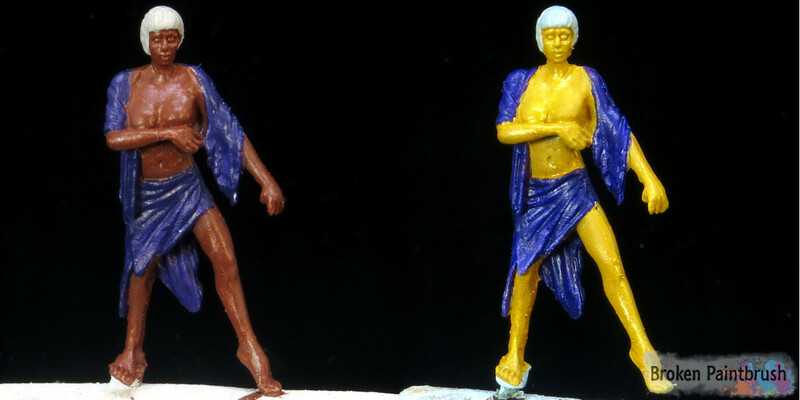 To keep the rest simple, both were painted with the same color robe and hair. As with most of my painting, the first step was to base in all the major colors. 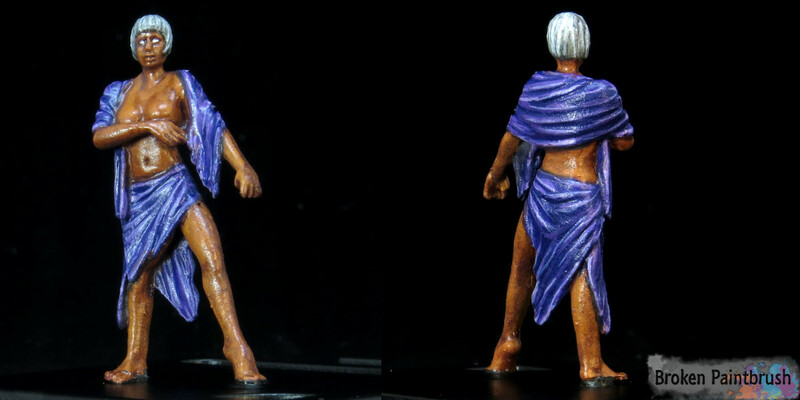 I started with the skin tones as they are the ‘lowest’ sections of the model and take up most of the area. 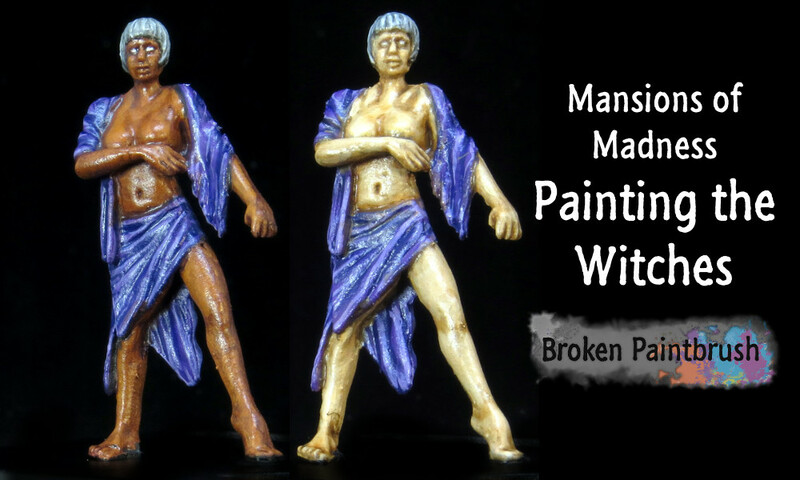 The dark skin was based with Mahogany and the light skin with Medium Fleshtone. The purple ‘clothes’ (as much as there is) were based on Royal Purple. And finally, the hair was based in Stonewall Gray to give them a bit of eeriness. Next up was to paint the skin colors. 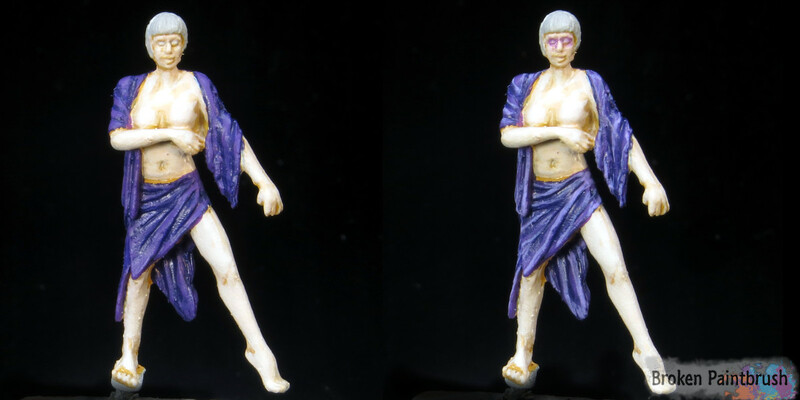 You will notice that the final glazes were done after the purple robes were finished. This was so they could add extra definition between the robes and skin layers as well as tone back the highlights. With both skin tones, I highlighted with two extra layers of much lighter shades before the glazes brings it back to where I wanted it. The highlights were also kept to a cooler color to emphasize their other-worldly nature. The biggest trick is to use plenty of Glaze Medium or Airbrush Medium in each layer to keep it smooth. Add the lighter colors only to the upper areas and allow the glaze to bring it back together. The same goes with the darker skin. Add lighter browns as you go, but keep them thin. The glaze helps to unify the look, so while the Light Brown layer was a bit blotchy in areas, the final glaze made it look ok. The robes were painted purple to help accentuated the cool nature. They were painted with simple layers that showed off all the folds and creases. The final details were finished up including shading and highlighting the hair and adding a few coats of matte clear. I hope you enjoyed the painting witches tutorial and that the skin tones guide may help you with projects.